What is the ASME Code? This examination has been developed to determine near-vision acuity of technical personnel in inspection, quality control, testing and nondestructive examination (NDE) activities. The test covers near-vision acuity and the ability to distinguish colors and shades of gray used in technical inspection, industrial radiography, ultrasonic, magnetic particle, liquid penetrant, eddy current and visual examination. The test comes with charts for Jaeger 1 and 2 near-vision and a color table featuring combinations of commonly used colors and shades of gray. Ten forms are attached to certify the results. The set comprises all you need to test and document near-vision acuity according to EN 9712 and SNT-TC-1A. Please note that this vision examination may not be used in lieu of a medical examination. Any need for optical aids or medical treatment is to be determined by an ophthalmologist. 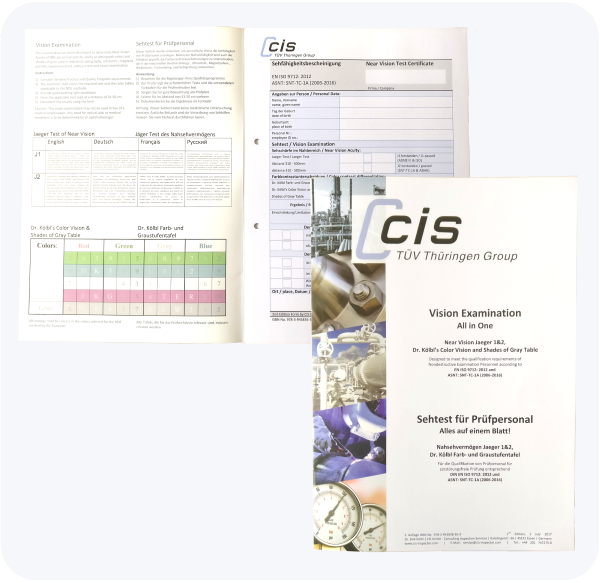 This video shows how to perform a vision examination for testing personnel of boiler, pressure vessel and piping manufacturers to meet ASME Code/SNT-TC-1A and PED/ISO 9712 requirements.